Macular degeneration is a common eye disorder that slowly damages a person’s central vision. It is currently the top cause for vision loss in people over age 55. The macula is located near the center of the eye’s retina. It is part of the inside back layer of the eyeball and helps to convert light and images into our central vision. Activities such as reading, recognizing faces and driving become difficult when the macula becomes damaged, which may reduce a person’s quality of life. Often referred to as age-related macular degeneration (AMD), as our population ages, macular degeneration becomes more prevalent. Fortunately, there is research underway to determine more effective ways to prevent the disease and to develop improved treatment options. The physicians at the Retina Health Center follow new developments closely. In fact, the Retina Health Center has founded the Macular Degeneration Research Center, located in Fort Myers, which focuses on research and new technologies to treat macular degeneration. The Macular Degeneration Research Center has been chosen to participate in several national studies on macular degeneration. Both Dr. Alexander M. Eaton and Dr. Hussein Wafapoor have worked with researchers at other major academic centers to be investigators in ongoing FDA trials of new treatments for both dry and wet macular degeneration. Please read on for additional information on macular degeneration or contact us today if you would like to schedule an appointment. Where is the macula and what is its role in your vision? The eye works like a camera. Light entering the eye is focused by the cornea and the crystalline lens to form an image on the retina. The retina sends the image through the optic nerve to the brain. The largest part of the retina is the peripheral retina, which provides your side vision. The macula is the retina’s central portion, which provides close-up vision needed for detailed activities such as reading fine print or threading a needle. Although tiny, the macula is a hundred times more sensitive to detail than the peripheral retina. When the central portion of the retina, the macula, is damaged, macular degeneration occurs. What are the symptoms? Most people who develop macular degeneration begin to notice problems with their eyesight after age 50. Typically, only one eye is affected initially, so you may not be immediately aware of the changes. Common symptoms include blurry text while reading, difficulty with distance vision, and objects appearing different sizes or colors in each eye. Patients also report dark spots in their vision, and objects such as Venetian blinds, trees or telephone poles can appear to be bent or crooked. Dry macular degeneration accounts for nearly 85 percent of all forms of macular degeneration and is caused by the loss of cells in the retina and/or buildup of deposits known as drusen. In some people, these spots on the retina lead to vision loss. Others may have dry macular degeneration for many years without any symptoms. Therefore, early detection and careful monitoring are crucial to maintaining good vision. 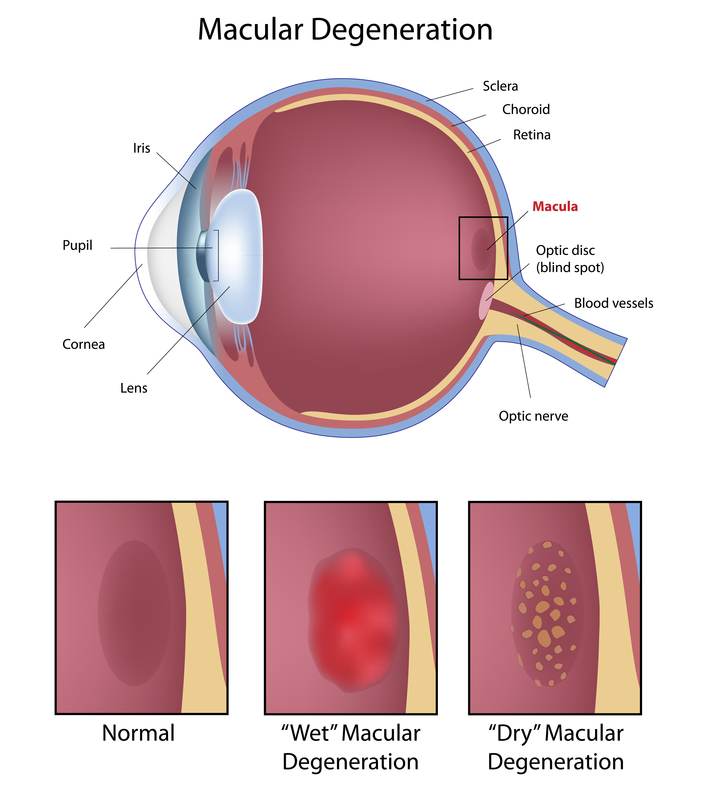 Wet macular degeneration is less common than the dry form, representing approximately 10 percent of all forms of macular degeneration. In wet macular degeneration, the abnormal blood vessels grow under or into the retina. Unlike normal blood vessels, the new vessels are more likely to leak blood or fluid, which can result in the retina becoming separated from its supporting tissues or swollen. This disruption of the normal retinal structure may result in rapid vision loss. If caught early, wet macular degeneration can be treated with medications, hot or cold laser, and/or surgery that can help to restore and or preserve vision. Pigment epithelial detachment is a type of macular degeneration that may develop in conjunction with dry or wet macular degeneration, or on its own. Pigment epithelial detachments occur when a blister forms underneath the retina, causing blurring and distortion of vision. Treatment with medications, and/or hot or cold laser, may be beneficial in certain cases. There is not a cure for macular degeneration, but research has shown that there are preventative measures. Sunglasses that block ultraviolet and blue light seem to limit the progression of the disease. Recent research has also proven that vitamins and minerals can slow down the progression of macular degeneration. The antioxidant vitamins C and E, lutein and the mineral zinc are important to your visual health. Please check with your eye doctor to see which is right for you. It’s also important to consult your medical doctor to make sure that vitamins will not affect any conditions you have or medications you take. Taking the right vitamins is important, and the Retina Health Center has a full line of vitamins to meet your needs. Finally, general good health is important. There is growing scientific evidence to show that people with a healthy cardiovascular system are likely to have a reduced risk of macular degeneration. On the other hand, a poor diet, smoking and lack of exercise can contribute to its development. If you are diagnosed with macular degeneration the next step is to confirm the diagnosis through special tests. When your doctor detects symptoms of wet macular degeneration, a special test called an angiogram and/or optical coherence tomography may be ordered. There are two types of angiograms, both requiring an injection of dye into your arm. The dye travels throughout the body and, as it passes through your eye, photographs are taken. These photographs allow your doctor to determine the presence and severity of the macular degeneration. There are several options for treating wet macular degeneration, including injections such as lucentis, eylea, laser therapy and surgery. Because we at the Retina Health Center have been actively involved in the research leading to the approval and adaptation of many of these medications and treatments, your physician has the experience to help you decide which of the treatment options is best for you. The most common treatment for macular degeneration involves injections of medication into the eye. While this may sound unpleasant, most patients feel little or no pain, thanks to anesthetics. Drs. Eaton and Wafapoor of Retina Health Center have also collaborated with researchers to invent a device specifically designed to improve patient safety and comfort during administration of eye injections. The device, developed in 2012, incorporates a small gauge needle that is covered by a thin protective sleeve which is designed to protect the needle from contamination risks before and during the injection such as aerosolized saliva droplets from speech or breathing, as well as from the eyelids or other external contaminants. The most effective medications available are Lucentis and Avastin, which can be used for the treatment of macular degeneration. Lucentis has been found to significantly improve vision in up to 40 percent of people with wet macular degeneration. Stabilization (< 15 letters of vision loss) occurs in up to 95 percent of individuals. Avastin, which is approved for the treatment of colon and breast cancer, can be used “Off Label” (i.e. it is not approved by the FDA for this use) and early reports have shown a similar response to that for Lucentis. Another medication, Macugen, is also available, but it tends to be less effective. When abnormal blood vessel growth is discovered early, laser treatment may be used to prevent further bleeding and deter future growth, helping to preserve vision. By applying laser light to the abnormal vessels that develop in wet macular degeneration, the vessels can be sealed and vision preserved. The procedure is performed in the Retina Health Center’s Fort Myers or Naples office under local anesthetic, takes only minutes and is virtually painless. Most patients resume their normal routines, except for strenuous activity, almost immediately. In some people, laser treatment may be performed after infusion of a photosensitivity drug, which helps to preserve vision. This treatment is called photodynamic therapy.The use of laser treatment is becoming less frequent due to the development and availability of medications like Eylea, Lucentis and Avastin. The use of surgery is becoming less frequent due to the development and availability of medications like Lucentis, Eylea and Avastin.